According to this unique fastening which get free the upper wrist, this timepiece seems to fly above the wrist as a butterfly ! 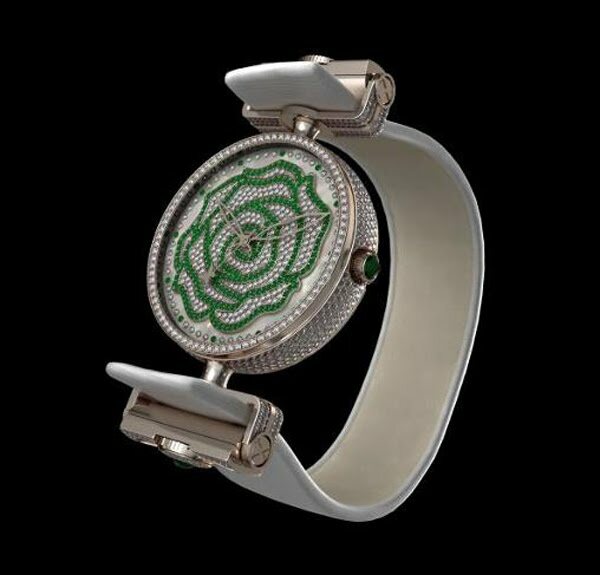 ​This unique timepiece is entirely set by 28 carats of diamonds and emeralds, welcoming a wonderful double-barrel movement. This movement has, furthermore, a unique wonderful thing : it possesses a power reserve of more than 120 hours (5 days). Every part of this watch is created and rose by hand, every decoration of the movement or the watch is engraved by hand. ​Created this unique timepiece requiring a work of setting extremely meticulous on a case manufactured in golden plots 18 carats and needed more than 6 months to deliver this ultimate timepiece. All the parts protecting the movement are golden 18 carats, case, bezel, back, screws, crown, etc. A guard-time of a rare complexity both by its movement and by the work of setting of the precious stones, all of quality VVS.